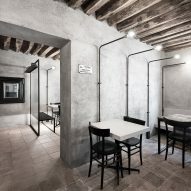 Studio Mabb has used a humble material palette of plaster, timber and iron to complement the rustic interiors of this eatery in Brescia, Italy. Located directly next to the Palazzo Martinengo art museum, La Ganea is housed inside a farmhouse that dates back to the 16th century. Offering a relaxed menu of beer, burgers and pizza, the restaurant takes its name from the Latin term ganea – a tavern or rest stop where travellers on long journeys could stop for refreshments. 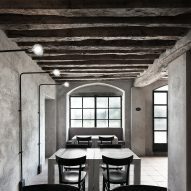 The adjacent 16th-century museum building features grandiose exhibition spaces with frescoed ceilings, but Studio Mabb wanted the interiors of the eatery to have an overall more simple aesthetic with a "particularly earthy component". To achieve this, the designers opted for an array of natural hues. "La Ganea is a project in which the venue gives life to the history of the place," Studio Mabb added. 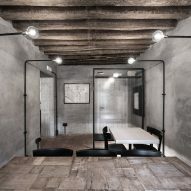 As extensive changes were not able to be made to the historic fabric of the 200-square-metre building, existing walls have been kept in place and washed with a lime-based plaster. 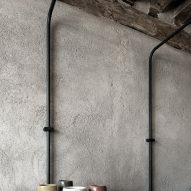 Wiring is concealed inside black iron pipes that snake up and away from the walls, ending with exposed light bulbs that illuminate tables underneath. 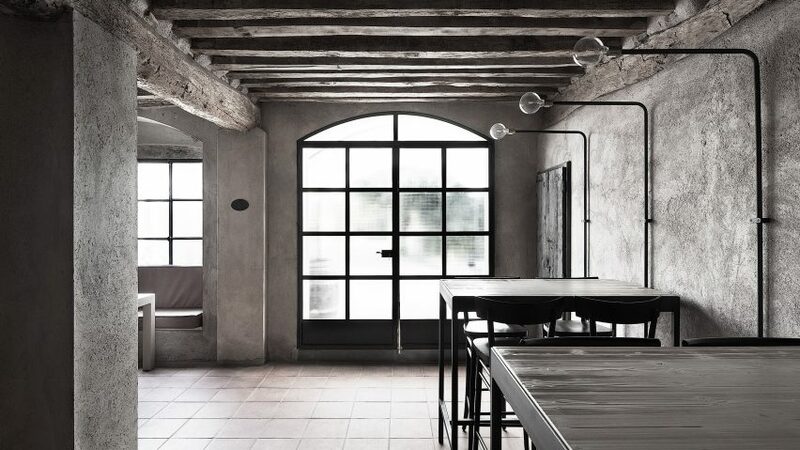 Iron is also used to form a chunky bar counter, shelving unit for liquor bottles, and to frame a series of arched windows that look through into a garden. 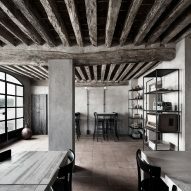 Sandblasted wooden beams have been affixed to the ceiling, while handmade tiles have been applied across the floors – the studio hopes their slightly worn patina will enhance the aged appearance of the restaurant. There are also two cosy side rooms where small groups of diners can intimately gather around long timber tables. A selection of books, maps, vintage trinkets, and glazed ceramic pots have been used to dress the space. 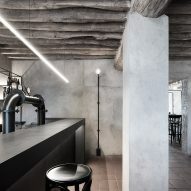 Architect Guillaume Terver also opted for a natural material palette when completing the interiors of a ceramics shop in Brittany, France, which boasts clay, granite and timber surfaces – it connects to a Japanese cafe, which Terver dressed with similarly simple oak furnishings. Photography is by Carola Merello.